BookshelfBanter.com and TST are celebrating the release of Bloodlines by Richelle Mead this weekend BEFORE it’s released next week, on August 23rd! The new series is a spin-off from The Vampire Academy Series. I read and reviewed the book earlier this Summer, and have to say that I love this new series even more than the original! You will have ALL weekend to enter this contest, and it’s easy! All you have to do is ReTweet on Twitter OR Like/Comment on Facebook, and we will select a WINNER at random this Monday night (August 22, 2011) at midnight! 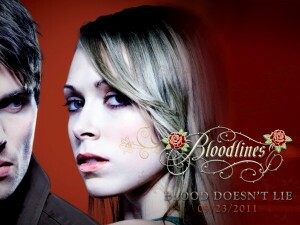 The winner will receive a copy of Bloodlines and some fun Bloodlines swag! Thanks to Penguin Publishing for providing this outstanding prize! To read/watch my review, click here! *You must submit your RT or Like/Comment by 11:59 pm, Monday, August 22,2011, to be eligible to win! What is the message we hae to retweet on twitter? Log in | 55 queries. 1.073 seconds.